An unusual idea which proved a great success! Sunday 8 July, the car park of The Ship Inn, Portloe, Cornwall. 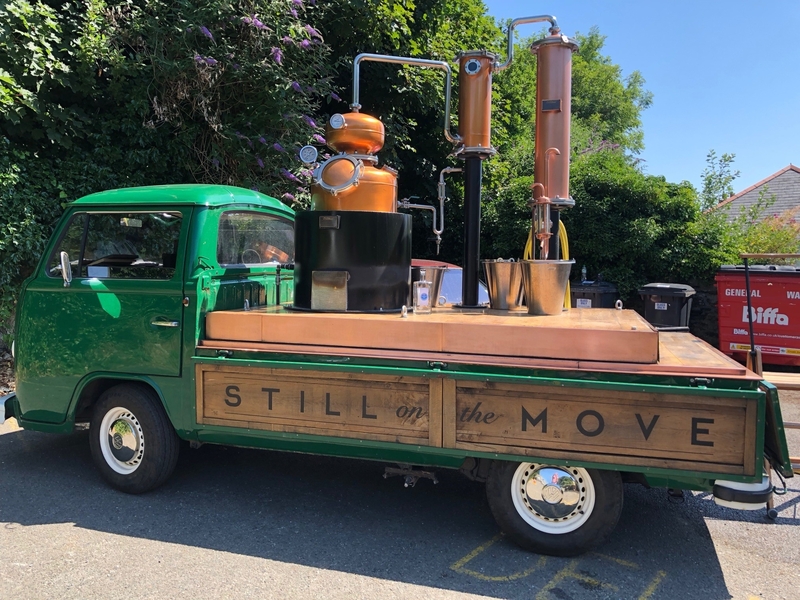 It was an unusual sight to see the Still on the Move distillery in The Ship Inn car park early in the morning distilling and bottling 140 limited-edition bottles of Portloe Gin. On what was one of the hottest afternoons this year, with not a cloud in the sky, well over 100 people joined the launch of the Portloe Gin and Crack-a-Crab afternoon in The Ship Inn garden, with many standing in the lane above. What a great atmosphere! So many local people and visitors came to enjoy the afternoon, listening to the jazz and blues trio Melange, who were excellent. With the first bottle of Portloe Gin being available just after 4pm, John Casson invited everyone to sample it and it proved very popular. Limited-edition bottle number one was won by Chris Pate, with Julie Parker, CEO of Penhaligon’s Friends, picking the winning ticket. The Crack-a-Crab also proved very popular. Thanks to Hannah Clark and her company Camel Fish Ltd for generously sponsoring all the crab. The afternoon was an opportunity for the village to get together to raise money for the Cornwall children’s bereavement charity Penhaligon’s Friends. As a result of everyone’s generosity, which included many people in the village who were unable to attend, £3,107.67 was raised for Penhaligon’s Friends. Last year they supported over 800 children in the county, helping them to cope with bereavement. John would like to thank Mark Swannell, for letting the John Casson Foundation host the event at The Ship Inn, The Ship Inn team; Melange, who played in their own time; Steve Powell, for being the safety officer in the lane; and his friends Alan Marr and Karl Friedrich, who helped him both with setting up and during the event. Last but not least, thanks to Jenny Casson for making the delicious desserts and cracking the crab. There are just a few bottles of Portloe Gin left for anyone who would like to make a purchase.